Creating a feel-good factor in your home doesn’t take much to achieve it. Grand gestures aren’t necessary in this case because it’s often the small things like a change in color scheme or making your work area more pleasant to spent time in that hit the spot. Here are 3 suggested improvements to enhance the feel-good factor. In many ways, the lighting sets the mood in the home. When you only have a simple ON/OFF switch and lack a dimmer switch, you cannot control the level of illumination. Especially on a Friday evening when coming home after a long week, it’s nice to dim the lights down to rest your eyes even before you’re going off to bed. Consider adding several lighting fixtures with different levels of maximum luminance. When set up thoughtfully, the varied lighting positioning and levels create a different feel than when only having a single light source in the center of the room. 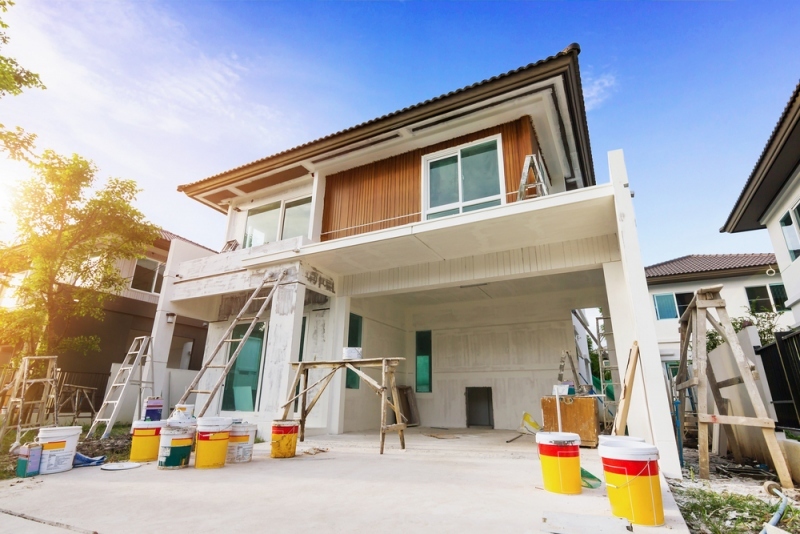 Repainting the exterior of the home, both front and back, creates a new look when driving up or when lazing about in the backyard. It is often interesting to try a different shade than was used before to mix things up. A light, pastel shade often works best here. When any exterior window shades are also repainted to mirror the chosen hue, it makes sure that everything matches perfectly. Changing the color also modifies how the home feels because colors link well to emotions even if we don’t realize it. Climbing up ladders and reaching across to paint every part of the walls right to the top can get risky. Many accidents occur every year when using ladders – hundreds of thousands, actually. You can slip when climbing between rungs or the ladder itself can either have an insecure footing on the ground or slip down from the side of the wall. For these reasons, it’s a good idea to try out the Protecta protection system. These safety harnesses can protect you from having a nasty fall. They’re far cheaper than a trip to the emergency room and the inconvenience of nursing an injury for several weeks too. Whether you have a dedicated home office or a dining table that doubles as a work area, it’s important to keep it clean, tidy and organized. Clutter has a way of fogging up the mind which is not great for efficient working practices. A clean working area or desk is more inviting to get stuck into a project than when it looks messy and unmanaged. Trying to be productive that way doesn’t bode well for most people even if they have a natural tendency towards being untidy and must fight against that. Everyone has a different criterion for what matters to them at home. Some people prefer quieter nights in while other people revel in the role of entertaining others. Make subtle adjustments to your home over time to add what feels good to you. It shouldn’t be about what will impress visitors; often a homely lived-in feel to your home is inviting enough to do that.